* Senior club appearances and goals counted for the domestic league only and correct as of 24 January 2007. Robert "Bob" Stokoe (21 September 1930 – 1 February 2004) was an English footballer and manager who was able, almost uniquely, to transcend the traditional north-east rivalry between the region's footballing giants, Newcastle United and Sunderland. As a player he won an FA Cup winner's medal with Newcastle in 1955 and in 1973 was manager of Sunderland in their famous victory over Leeds United. Born in Mickley, near Prudhoe, Northumberland, the son of a miner, Stokoe began his footballing career at Newcastle United, signing for them as an apprentice in 1947 and playing the first of 261 games, usually as centre-half, on Christmas Day 1950 against Middlesbrough, a game in which he also scored. The highlight of his 13 years at Newcastle was the 3–1 1955 FA Cup Final victory over Manchester City. After leaving Newcastle and joining Bury in February 1961, Stokoe spent a short time as a player before making the move into management with the same club as player-manager later that year. Stokoe took the post of player-manager at Bury in December 1961 which at 31 years of age, made him the second-youngest manager in the football league. He led them to the semi-finals of the League Cup in 1962–63. He stopped playing in 1964, staying on as manager for another year after which he moved south to take charge at Charlton Athletic from 1965–1967. He was manager of Rochdale from 1967 to 1968, followed by three separate spells at Carlisle United (1968–1970, 1980–1985 and 1985–1986). Between spells at Carlisle, Stokoe managed Blackpool from 1970–1972. He was initially approached by the club in the summer of 1969, after the departure of Stan Mortensen. At the time, he declined, preferring to stay with Carlisle; just over eighteen months later, however, he became the ninth official manager in Blackpool's history. With Blackpool relegated to the Second Division before he could get his feet under his desk, Stokoe began to clear out the "deadwood" and rebuilt the side more to his liking. Stokoe agreed to sell Tony Green to his old club, Newcastle, bringing striker Keith Dyson in the opposite direction. Before the departure of Green, Blackpool enjoyed a successful venture into Europe, winning the Anglo-Italian Cup in June 1971. In the league, meanwhile, the Seasiders finished in sixth place. This still was not good enough for the fans, however, who became disenchanted with life outside the top flight again, and the club's style of play under Stokoe was not to their liking. Another successful run in the Anglo-Italian Cup the following season (losing finalists to Roma) kept the critics at bay, but the feeling around Bloomfield Road was that the 1972–73 campaign would be critical. Stokoe's third season at Blackpool started well enough when, with the team reasonably placed for a promotion push and having stated that he intended to remain at the seaside for five years, he left the club. He had been lured back to his native north-east by Sunderland. 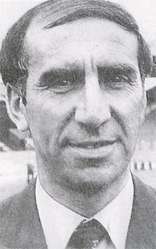 Stokoe took over as manager of Sunderland on 29 November 1972 when they were fourth from bottom of the Second Division table after a run of just four wins in 18 games. Although his first game in charge was lost 1–0 at home to Burnley, the following week seemingly liberated players won 3–2 away at Portsmouth. Just six months later on 5 May 1973, having already beaten Manchester City and Arsenal on their way to the final, Stokoe took the Second Division club to Wembley and defeated the cup holders Leeds United to secure Sunderland's first FA Cup win since 1937. Managed by Don Revie whom Stokoe had opposed when playing for Newcastle United in their 1955 FA cup final victory over Manchester City, Leeds United were a team packed with international players and strong favourites to retain the trophy. However, Sunderland scored in the first half through Ian Porterfield and with the help of a memorable second-half match-saving double save from goalkeeper Jim Montgomery, managed to win 1–0. The victory was the first time a second division team had secured the Cup in 42 years. Stokoe is remembered for his impromptu jubilant run across the pitch at the end of the game, complete with his trademark trilby hat, to celebrate the victory with Montgomery. A statue of Stokoe with his arms held aloft in celebratory mid-run now stands outside Sunderland's Stadium of Light. None of the Sunderland players had been capped at the highest level when they lifted the cup, though some were capped later. The side finished 6th in the second division that season and narrowly missed promotion in the following two seasons. In 1975–76, he guided the club to the Second Division title. He tendered his resignation the following season after they struggled in the First Division with a start of nine straight games without a victory. In May 1978, Stokoe returned to Blackpool with the club in dire straits. Under the managership of Allan Brown they had been relegated to the Third Division for the first time in their history and were looking for someone who could rebuild a once-proud playing tradition. He guided them to a mid-table finishing position, and then resigned again before the start of the 1979–80 season. There followed another spell with Rochdale (1979–1980) which ended with the club having to seek re-election to the league and spells with Carlisle United (1980–1985 and 1985–1986). He led Carlisle to promotion to the Second Division in 1982, and in the 1983–84 season they became promotion contenders before a poor run saw them finish 7th. He resigned in 1985, only to be reappointed and resign again seven months later. Towards the end of the 1986–87 season, he was appointed caretaker-manager of Sunderland as they struggled in the Second Division. They narrowly lost on goal difference in the end-of-season relegation-promotion playoffs and were relegated to the Third Division for the first time in their history. His contract was not renewed and he retired from football. During his whole career as a manager he was never sacked by any of his clubs. 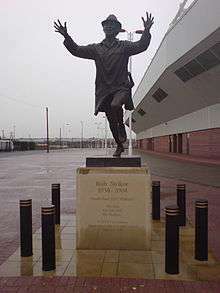 A statue of Stokoe stands outside Sunderland's Stadium of Light. After being unwell for some time with Alzheimer's disease, Stokoe was admitted to hospital in Hartlepool suffering from pneumonia and died on 1 February 2004 aged 73. The respect offered by both rival fan groups of Newcastle United and Sunderland was marked by their attendance at his funeral at the crematorium at Newcastle upon Tyne. The Reverend Neil Cockling, the Methodist Minister for Prudhoe, who conducted the service, told mourners: "He will be remembered by all as a real gentleman. Such was Bob's standing that we can see Sunderland and Newcastle here together today to celebrate his life." 1 2 3 Calley, Roy (1992). Blackpool: A Complete Record 1887-1992. Breedon Books Sport. ISBN 1-873626-07-X. ↑ "Funeral service for soccer legend". BBC News. 10 February 2004. Retrieved 26 April 2010. Harrison, Paul; Bob Stokoe (2009). Northern and Proud: the Biography of Bob Stokoe. Know The Score Books Sport. ISBN 1-84818-505-7. Hardy, Lance (2009). STOKOE, SUNDERLAND AND '73. Orion. ISBN 978-0-7528-8340-3.